Successfully Added One-Handed Game Keyboard - 29 Keys, RGB Backlit, Soft Palm Rest, Metal Body, Plug And Play, Works With All Major OS to your Shopping Cart. Take your gaming experience to the next level with the T9 Plus mechanical gaming keyboard. This one-handed keyboard features merely the 29 essential keys for gaming. Thanks to this, you no longer have to struggle with a regular large keyboard and all those useless buttons while playing your games. It comes with a soft palm rest that brings along great comfort during your upcoming gaming sessions. With its plug and play design, you simply have to plug it into your PC and you’ll be ready to go. 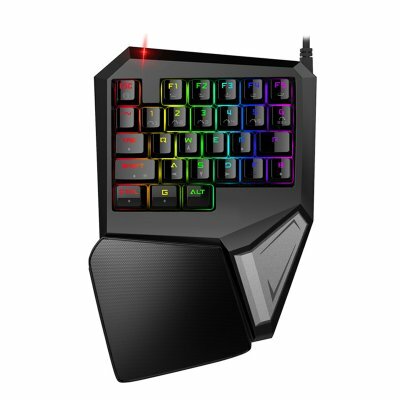 With this one-handed gaming keyboard at your side, you’ll be able to take your gaming to entirely new heights. The mechanical keyboard comes with RGB backlit buttons. Thanks to this, you’ll be able to use it at night while simultaneously amazing fellow gamers with stunning light effects. With its full-metal body, your one-handed keyboard has a cool look and is extremely durable. It works with Windows, MAC, and other major operating systems. This means that you can use this stunning gaming gadget with the vast majority of computers out there. If you are looking for the ultimate gadget to upgrade your gaming experience, this 29-key one-handed mechanical game keyboard is perfect for you. This game keyboard comes with a 12 months warranty, brought to you by the leader in electronic devices as well as wholesale electronic gadgets..